Begonias Hello, I've been given this very unusual Begonia which I've planted in a semi-shaded position and it seems to be doing quite well but it hasn't flowered yet. As you can see it has amazing foliage - does anyone know which Begonia this is please? Hello, I've been given this very unusual Begonia which I've planted in a semi-shaded position and it seems to be doing quite well but it hasn't flowered yet. As you can see it has amazing foliage - does anyone know which Begonia this is please? There are countless species and related cultivars within the Begonia genus. The RHS has broken the genus into 7 main groups based on growth habit and cultivation needs. 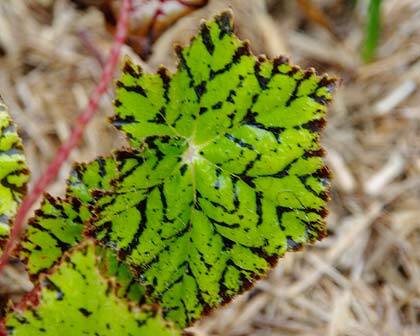 This one is a Rhizomatous begonia which tend to be grown for their wonderful leaves and compact rounded growth habit. The leaves vary greatly, many have intricate patterns, some are hairy others smooth and shiny. We think this one might be called 'Les Findley'. Bigger Hostas Hey Folks, I have approximately 50 hostas and I don't want to divide them, just make them larger. What would you suggest?